These red velvet cupcakes are so moist, so amazing… by changing around the proportion of a few ingredients, subbing oil for butter, sour cream for butter milk… I think I succeeded!!!! I’ve also felt like the recipe could probably use less food coloring… so I reduced that in half to 1 oz. (instead of 2 oz) – and found no difference in color (so save $$ and use less food coloring)! If you make red velvet cake a lot, consider purchasing red food coloring in a big bottle. I got a HUGE bottle (about 2 cups worth of red food coloring) at Smart & Final for about $7… which is next to nothing considering a small 1 oz. bottle at the supermarket can run you anywhere from $3 – $4. 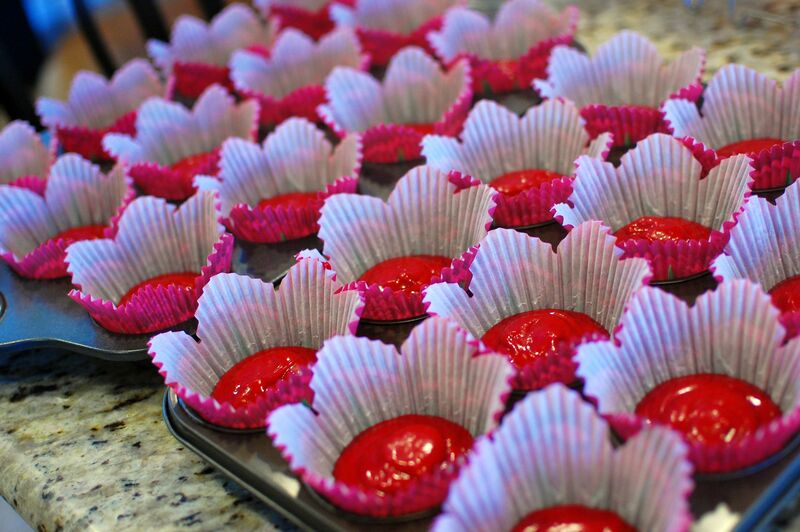 Since I was making these cupcakes for my soon to be sister-in-law’s bridal shower, I made them a little bit fancier by using the Wilton Petal Baking Cups. These are a little bit taller than regular paper baking cups, so I was able to fill 24 of them using the entire recipe… without any overflowing batter or exploding cupcakes in the oven (you will yield more like 30 cupcakes using regular liners). The nice thing about using these taller baking cups (which fit in a normal sized cupcake pan, by the way), is that the cupcakes are easier to bake without worrying that they are overcooking or drying out. 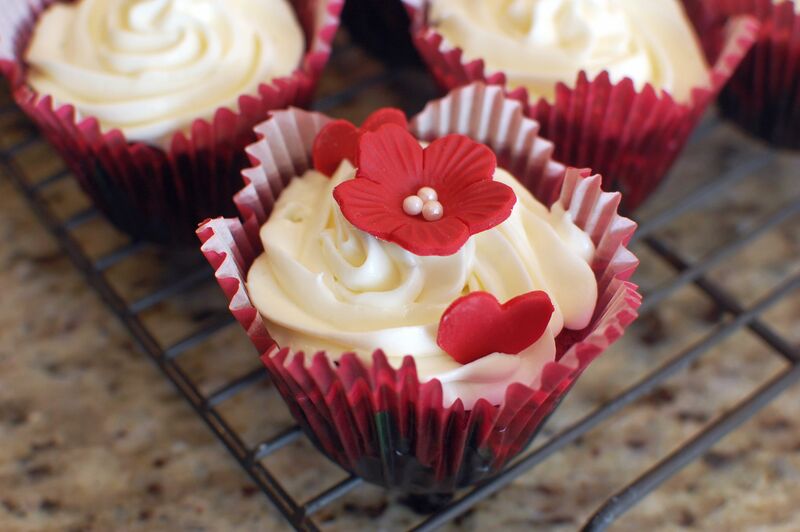 This time, I used the Wilton Red Rose Petal Baking Cup – I liked how the red rose design looked, and thought it was a pretty combination with the red velvet cupcakes. 1. Preheat oven to 350 degrees. 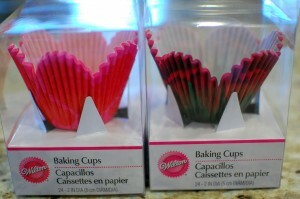 Prepare cupcake pans with paper liners. 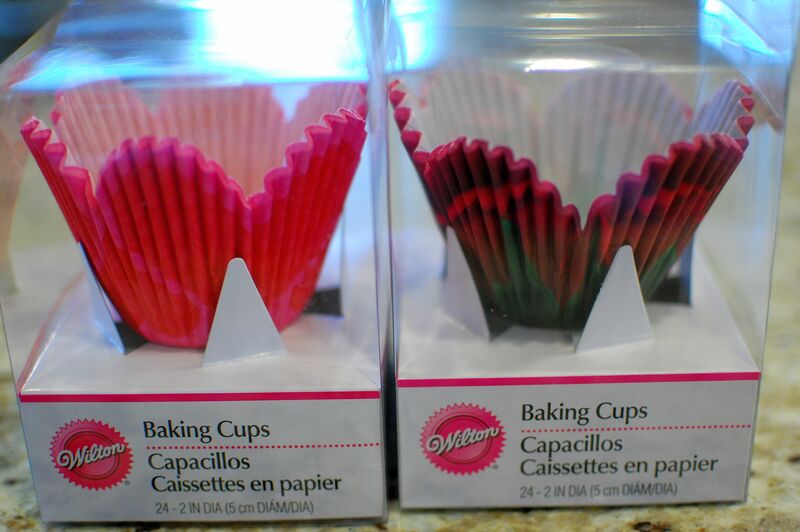 This recipe will make 24 large cupcakes if you are using the tall Wilton “Petals” style baking cups like I did… or about 30 normal sized cupcakes if you are using regular paper liners. 2. Sift the flour, salt, baking soda, and cocoa powder. Set aside. 3. 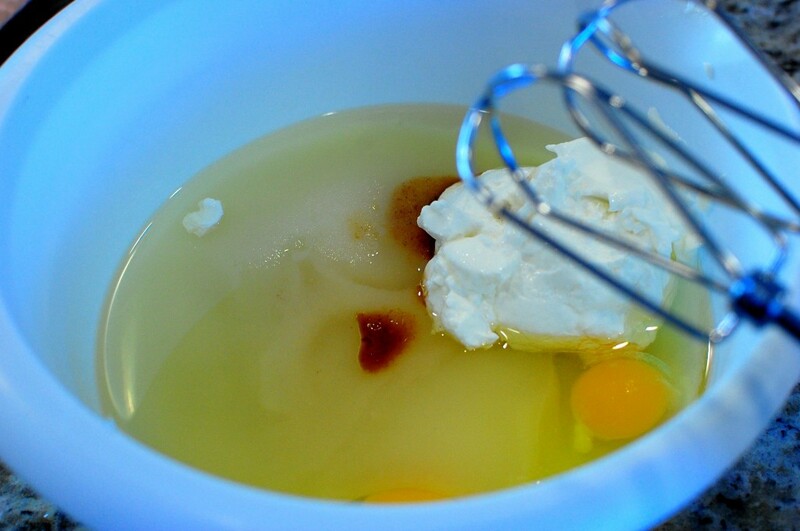 Mix the sugar, eggs, oil, sour cream, vinegar, and vanilla until combined. 5. Mix the wet ingredients into the dry, until thoroughly combined – but do not overmix! 7. Bake at 350 degrees 18-20 minutes. (Closer to 18 minutes for regular sized cupcakes, it took a full 20 minutes for the 24 large cupcakes.) Remove to a wire rack to cool completely. UPDATE 27 October 2013: I’ve been getting a few comments from people saying these cupcakes sunk in the middle upon cooling. Folks, that means the cupcakes WEREN’T DONE when they were removed from the oven. You have to check! Don’t take my word for it that it will take “20 minutes” to bake… my oven, my atmospheric conditions… so many other factors can influence the time it takes for the cupcakes to bake. At the 18-20 minute mark, push the tops of the cupcakes with a clean finger. If they feel soft, or under cooked in the center, then DON’T remove them from the oven! Bake another 5 minutes, then check again. Still soft? Bake another 5 minutes. 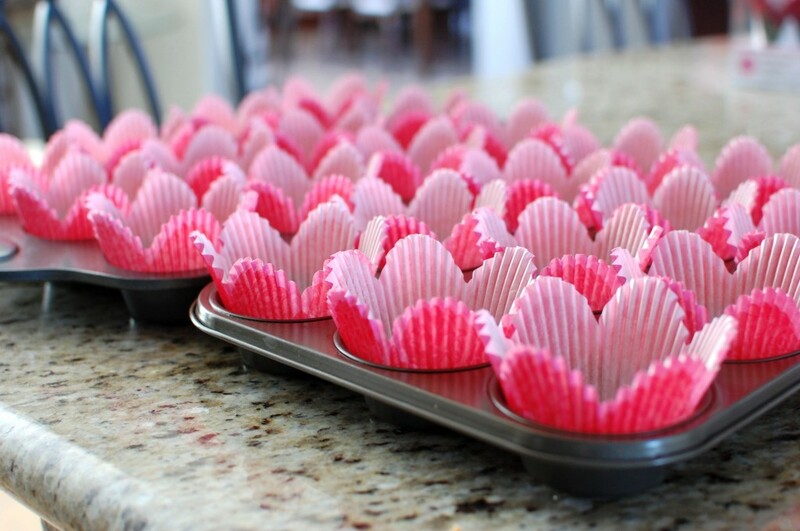 It could possibly take up to 30 minutes for the cupcakes to bake depending on several factors. Cupcakes that appear normal looking in the oven, with a center that sinks in upon cooling – the #1 reason for this is underbaking. It means the center was not fully cooked or set! Unfortunately, there is no way to save them at that point – you can’t return the cupcakes to the oven once the centers have sunk. So make sure you do not underbake your cupcakes! 8. 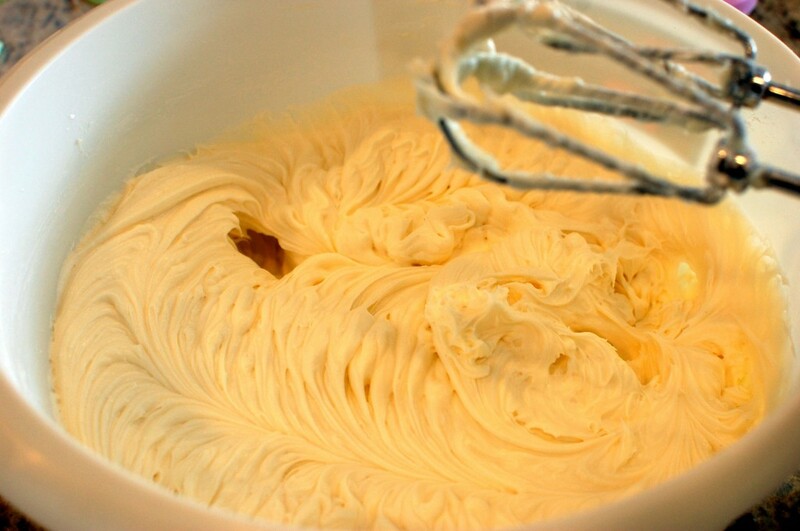 Mix the cream cheese, butter, salt, and vanilla extract until uniform. Add the powdered sugar, and mix on low until combined. Then, mix on high speed for 1-2 minutes to make fluffy. 9. 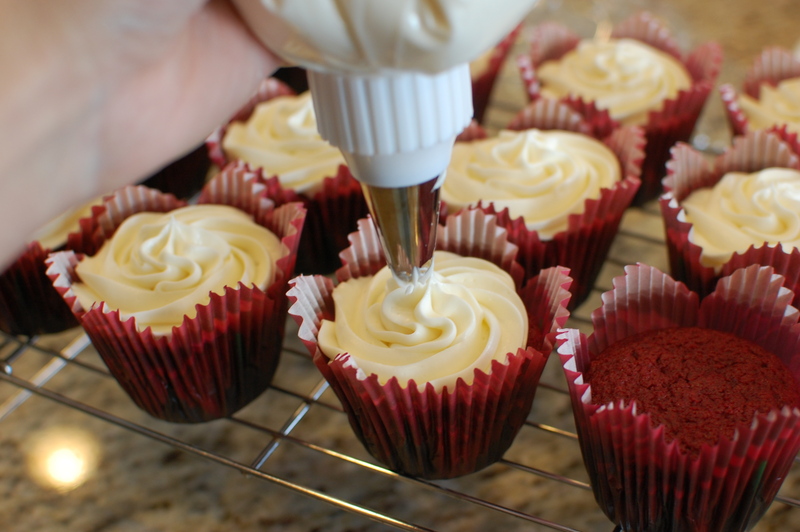 To frost, you can spread the frosting on with a knife… but to make these cupcakes really pretty, pipe the frosting on. Snip off the corner of a gallon sized Ziplock bag, and fit the open corner with a large star tip. Scrape the frosting into the bag. Starting from the outside, pipe the frosting in a spiral pattern toward the center. When you get to the center, continue piping as you pull the tip up – then stop – and pull completely up. For piping the frosting onto the cupcakes… I don’t like to use regular sized piping tips – extra large tips work much better. My favorite, most useful set is the Extra Wide Decorating Tip Set made by Ateco. There are two tips in this set – a star tip that makes lovely swirls for frosting, and a round tip that is good for piping dough for cream puffs or eclairs. For less than $8, it’s a good value, and I use the star tip all the time! I normally don’t use the piping bag that comes with the set – because I’m too lazy to clean it – instead, I just use Ziplock bags so I can throw away the mess! 10. As is, the swirl of frosting is quite decorative and pretty. But if you want to continue decorating your cupcakes, you can sprinkle with cake crumbs (sacrifice one cupcake and pulverize it into crumbs using a food processor), or with fondant flowers. For a tutorial on how to make fondant flowers, see my post “How to make Fondant Roses, Flowers, and Royal Icing“. They look delicious! I love red velvet cake and haven’t been able to find a recipe I am in love with so I definitely have to give these a try. Thanks Ingrid! Let me know how yours turn out when you have a chance to try it! You probably could reduce the oil… maybe substitute 1/2 cup of the oil with something moist like applesauce… but I like this recipe the best with the full amount of oil. This is something I’m definitely going to try. I am so in love with red velvet cakes. Thank for the recipe..
hi! I LOVE this they look amazing, i will try it next days..But i have one general question. My cupcakes are not rising equally. Their surface is not equally round, in some parts they look like frozen volcano that tried to get out. Why this happens? If this is something you experience with any cupcake recipe you try, there could be several reasons – most of them relating to heat. 1. If your oven is too hot, then you will likely get peaks in your cupcakes. You might get your oven calibrated, or maybe set the oven 5 degrees lower than your recipe instructs. 2. If your oven has uneven heat, you might also get an uneven rise to your cupcakes. Try rotating your pans 2/3 way through baking (make sure the cupcakes are somewhat set before you attempt this, or they will collapse). 3. Did you preheat the oven? Make sure the oven is preheated for at least 10-15 minutes so that you are more likely to have even heating when you start baking. Do not leave the oven open for too long. You can also put a pizza stone in the bottom of your oven before you start preheating to improve your chances of even heating. 4. Did you add too much leavening (baking soda or baking powder)? Make sure you are adding teaspoons, not tablespoons, and that you level off the spoon with a flat edge. Don’t add heaping teaspoons. Make sure you measure all ingredients accurately. 5. Did you change the ratio of ingredients? Too many people alter cake recipes by reducing the sugar, or substituting for the fat, then wonder why their cake turns out wrong. Baking is more like chemistry than anything else, and if you change or throw off the proportion of ingredients, you might not have the result you desire. To make mini cupcakes with my red velvet cupcake recipe, you might have to experiment to see what the best time is. I would guess somewhere between 12-15 minutes, but start checking around 10 minutes. 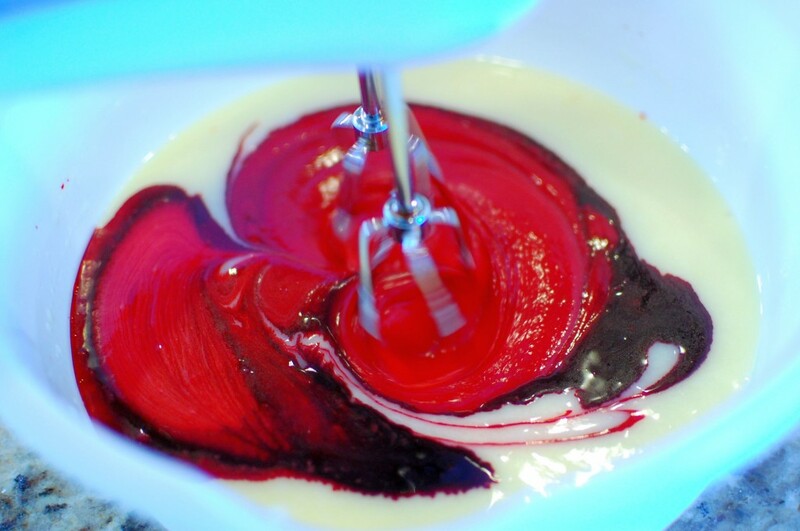 Also, I have never tried this recipe with gel food coloring instead of liquid – what you might do is mix the gel food coloring with about 1 1/2 to 2 T. of water, because the liquid food coloring does add a bit of moisture to the batter, and by omitting it, you might make your cupcakes dry. Regarding the carrot cake recipe… putting filling in before baking… I’m not sure, especially if you are doing it in mini-muffin tins. You could always try it and see how it turns out. Thank you very much for the reply, I will try mixing the jel with water. I will let you know how things turn out . You’re welcome! Hope it turns out ok! Hi. My daughter and I just baked red velvet cupcakes yesterday.. our first try! Results are not bad for first timers. I just searched thru the internet for a recipe and how to bake them, but unfortunately its not as moist as I want them to be.. most of the ingredients you have [in your recipe] are the same same as what I used except for the 1 1/2 cup of canola oil – instead I used 1/2 c. of butter. Also, does it make a difference if I omit the baking powder and just use baking soda instead? With regards to our frosting, I want them to come out stiffer… it sogs easily.. some suggested to put cream of tartar, or put some more powdered sugar, which I would not prefer cause I do not like very sweet frosting. I want them to actually taste a lil sweet concentrating more on the taste of the cream cheese which is a lil sour.. If you may please suggest what to do with my queries, it will be very much appreciated. My twins are turning 8 this on the 29th, and id like to bake for their birthday.. thanks and good day! Hi Anna. I will do my best to answer your questions! First of all, if I am understanding correctly, you did not use my recipe for red velvet cupcakes or my frosting – right? You found a recipe somewhere online that called for 1/2 c. of butter, and you found that recipe to be a little bit drier than expected, and the frosting recipe that you tried was a little bit too runny (or not quite stiff enough)? My original recipe for red velvet cupcakes called for 1/2 c. of butter – and like you, I also found the cupcake it produced to be good… but not quite as moist as I wanted. I found that by using oil instead of butter (in the proportion called for in the above recipe) far superior for producing moist cupcakes. For some reason, oil does a much better job than butter, when you want a really moist cake. In cakes where the butter is not the main flavor “star” – like in chocolate, red velvet, or other flavored cakes, oil-based recipes seem to turn out a much better texture. So try my recipe (above) for ultimate red velvet cupcakes instead, and see if you like it better. As for using baking powder… neither one of my red velvet recipes call for baking powder. With red velvet cake, you traditionally want to use baking SODA, not baking POWDER. The baking soda reacts with the vinegar in the recipe to produce the leavening effect… and the vinegar also reacts with the cocoa powder to produce a reddish color. 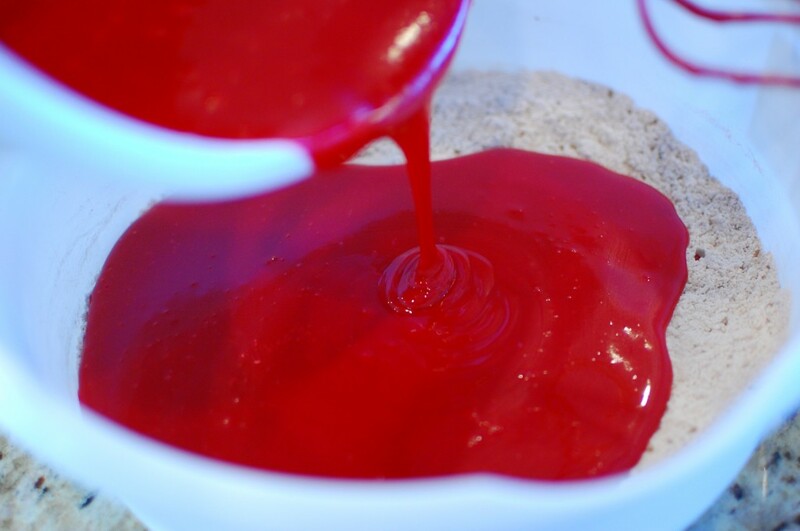 (This was how old school red velvet cakes got their red color… nowadays we tend to prefer a brighter red color that can only be produced with red food coloring.) Also, baking powder and baking soda CANNOT be substituted with a 1:1 ratio. While it takes 1 teaspoon of baking powder to leaven 1 c. of flour, it only takes about 1/4 tsp. of baking soda (combined with some other acid in your recipe) to leaven 1 c. of flour. So be careful… the two are not necessarily interchangeable, unless you really know what you are doing and how to modify the recipe to account for the changes. Regarding the frosting, powdered sugar is what we generally use to “stiffen” the frosting. If you do not add enough powdered sugar, your frosting will be as runny as your whipped cream cheese, and no amount of cream of tartar will change that. Cream of tartar is used when whipping egg whites to help stabilize the foam – it does not make egg white foam any stiffer – it just keeps the foam from collapsing. It will do absolutely NOTHING for a cream cheese based frosting – and a little tiny jar of it is quite expensive – so don’t waste your cream of tartar on the frosting, it will not help. A better alternative to stiffen a cream cheese based frosting (without adding extra sugar) might be unflavored gelatin. Combine about 1/2 T. (tablespoon) unflavored gelatin with the same amount of water, and stir to dissolve. Add it to your frosting, mix well, and then refrigerate for a few hours. When you take it out, you may want to beat it with an electric mixer to get it nice and fluffy. The gelatin should help stiffen the frosting a bit without adding extra sugar – but don’t go overboard with cutting back the sugar, because you do still need some sugar for structure… otherwise you will find that your frosting begins to slide off or melt as your cupcakes sit at room temperature. Let me know how it turns out, and happy birthday to your children! Wow! Such a detailed response.. Very much appreciated! Sure, i’d let you know how it will turn out.. The next trial will be for my kids’birthday. I will have them ready by saturday.. I am a cook that has no room for much errors.. I am into food catering but not into baking so i wanna learn how to bake too.. Yes, i was not able to see your recipe yet when i first tried to make them. And when i searched how to make them more moist, there i found yours. And i am really glad that it didnt take much time to get a reply.. I love sour cream, and i used buttermilk instead, one that i made accdg to instructions too. I am a perfectionist when it comes to my cooking and i wont stop till i grade myself high enough to serve them to other people. And we love to eat red velvet cakes.. Only its way too expensive to buy.. So i wanna perfect making at least the cupcakes to we wont have to buy..
Again I would like thank you for replying to queries then. And I truly appreciate the effort.. Thanks and God bless! Hi Anna! I’m so glad it turned out well. It took me forever to figure out how to make really moist red velvet cupcakes, but I think I finally hit the nail on the head with this one. As far as the frosting goes, I’ve always been pretty happy with my Cream Cheese Frosting – it is never too sweet for me, but I know everyone has their own level of “perfect sweetness” – I’m glad you liked it. Hope your kid’s birthday party is a blast! your ingredients for ultimate red velvet cupcakes say vinegar, is this distilled white vinegar ? Generally, if your cupcakes (or cakes) sink in the middle, it means they were removed from the oven too soon. The centers were probably not done (or set) so upon cooling, the structure collapsed in the middle creating the sunken effect. The baking times I post are guidelines – what has worked in my oven, in my climate/environment. But not all ovens are the same, and atmospheric conditions (elevation, humidity, outside temperature) can also affect how long it takes for something to bake. You want to make sure you check for doneness before removing the cakes from the oven. The simplest method is to do this is to stick a clean wooden toothpick into the center of the cake and remove – if it comes out clean, then your cake is done. The method I use is to gently poke the top of the cake with a clean fingertip – if the cake immediately springs back, then it’s done (if the indentation stays in the cake, then it needs to bake a bit longer). Bake another 2-3 minutes at a time until the cakes test to be done. 1. Always preheat your oven 20 minutes before baking. 2. If you suspect your oven doesn’t heat evenly, or if it cycles on and off, you can help control the temperature by placing a ceramic pizza stone (or unglazed ceramic tile) in the bottom of your oven before preheating. 3. Switch the cupcakes (or cake pan) on the top rack with the cupcakes on the bottom rack midway through baking. 4. Always test for doneness before removing from the oven to cool. 5. Always measure your ingredients exactly. 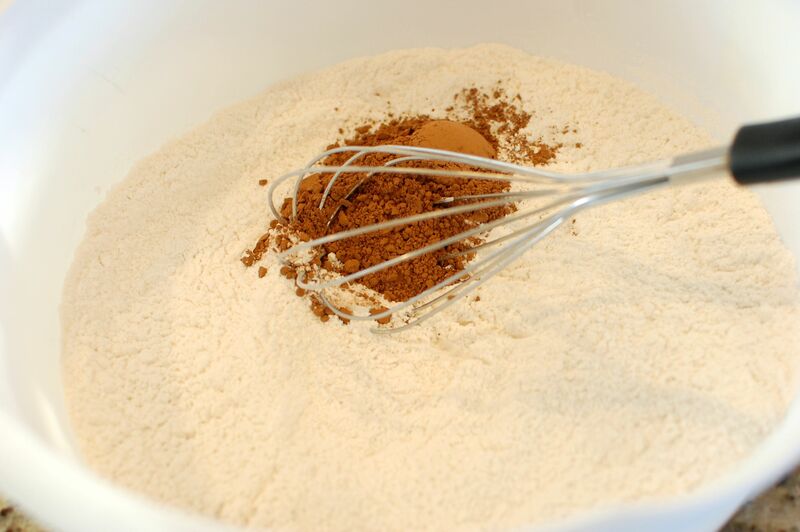 For example: do not tamp flour down into the cup – gently scoop it in, then level it off with a straight edge. Do not add extra ingredients or make substitutions. Hi there! For this recipe, I use all purpose flour. Usually I mean “all purpose flour” when I write “flour”. I use regular granulated sugar for the cake batter, powdered sugar for the frosting. hello! i love red velvet and i’m planning to make using this recipe but sour cream is hard to find in our place. what can you suggest to substitute for the sour cream or how can i make a sour cream? thanks! Hi there! If you cannot get sour cream, I would suggest using full fat (not nonfat or lowfat) plain yogurt. Can I assume that T. stands for tablespoon? And is it possible to use other types of oil instead of canola oil? And for this recipe, you can absolutely substitute for any light (flavorless) oil (like corn oil, vegetable oil, etc.). You just wouldn’t want to use any strong flavored oils that may have an overpowering taste (like olive oil, walnut oil, etc.). Hi if I make a cake out of this recipe how big a cake will it make? Half kilo or more? Hi there! I’m not sure about weight for the final cake… but if you are not looking to make cupcakes, and want an actual “cake” instead… you could probably make three 9″ round layers with this recipe. I would bake at 350 degrees… start checking for doneness around 18-20 minutes or so. Depending on your oven it may take longer for the layers to bake. Hi, i would like to ask if i can substitute 1c buttermilk instead of sour cream? Yes, you can. I like the recipe better with sour cream… but if you don’t have it, you certainly can use buttermilk. Can I use sour cream as a substitute for buttermilk with some water or something or no? In this recipe, I use sour cream not buttermilk. Are you asking if you can use buttermilk instead of sour cream? If so, then yes. Does it truly matter if I added an extra egg.??. I am trying to find cupcakes that just melts in your mouth that it eaves no time for swallowing.. Lol.. Or should I add a tsp of oil.. I fell in love with a friend of a friend cupcakes whom does not wish to share the recipe.. Jer cucpakes literally melts before one can swallow.. I have yet to find a recipe or restaurant that presented the same type pf cupcakes! Thus, I am on a mission to make myself ! Did you accidentally add an extra egg to your batter, and now you are asking if it will ruin your final cupcakes? If so, it might be ok… I wouldn’t add any extra oil to compensate. Just try baking as is and see how it turns out. I apologize for the late response. So, I had followed your recipe to the “T” ! It was delish; however, all my cupcakes did not rise , it really sunk in.. The next batch I went ahead and filled the liners a bit less than 1/2 and it still sunk in. Also, I had used the hand mixer rather than my stand mixer; as I had found that my cupcakes usually are flat but for these delicious red velvet cupcakes it sunk in. My oven is a gas oven could that be the reason?? I also did not leave the eggs for room temperature or the sour cream, could that be the reason to the sunken cupcakes?? Also, i had notice that the batter was very thick and took longer than usual to fill the liners ,is that normal? Despite that it was quite depressing, it did not discourage my family whatsoever. Your expertise is appreciated. 2. If your oven temperature is not even or hot enough, you may have to bake your cupcakes longer. The #1 reason why cakes or cupcakes sink in the middle, is from underbaking. If the middle is not set, your cupcakes will sink when cooling. Make sure you test your cupcakes before removing from the oven – I like to poke the center of several cupcakes with a clean finger – if the cake springs back, then it’s done. If it feels too soft, or your finger makes a dent, then it’s still not cooked enough. The baking times I have posted are approximate – they work for my oven and my atmospheric conditions – but you may need to bake longer or shorter depending on your specific conditions and your oven. To make sure my oven has an even temperature, I leave a ceramic pizza stone in the bottom of my oven and make sure to always pre-heat the oven at least 15-20 minutes before attempting to bake anything. Starting with cold ingredients will also increase the time it takes for the cakes to bake completely. As far as the batter being “thick” – I’m not really sure what you mean. The batter on this is just like any other cake batter – neither thick, nor thin – so if you found your batter to be too thick then maybe you added more flour than necessary, or accidentally left out one of the moisture ingredients? When measuring your flour, make sure you do not TAMP the flour down, or hit the measuring cup against something to “Settle” the flour. This will cause the flour granules to pack down really tight, and you will end up using too much flour. You want to stir up your flour first, then lightly scoop the loosened flour, then use a straight edge (like the back of a butter knife) to sweep the excess flour off the top of the cup back into the bag of flour. I was wondering if you can advise on how to adjust the proportion of this recipe to make less cupcakes. I want to do a test try to see how the recipe is before actually using the full recipe. I’m a beginner to baking, so I would like to see how the result is before I make a bunch and waste ingredients if I make a mistake. Also, would this recipe still be as tasty if I make it the night before an party? Why don’t you cut the recipe in half then? And yes, you can make these the night before serving. Make sure you do not remove them from the oven prematurely. Start checking around 18 minutes for regular sized cupcakes (fill liners halfway only). Thank you for the quick response Mika. I will let you know how the cupcakes are once I make. Thank you! You’re welcome! Hope it works out for you! Hi there wat kind of vinegar do I use in this recipe? It would be best to use distilled white vinegar. But you can also use apple cider vinegar, rice vinegar, or palm vinegar. Basically, any mild tasteless vinegar. Hi, I just tried this recipe and I love it! Especially the cream cheese frosting. It’s the perfect sweetness. I just want to ask if i can reduce the amount of oil? There’s some excess oil seeping out of my cupcake liners and they’re not the most pleasant things to see. If i can reduce oil, how much would be perfect to retain its original moisture? Also, can I substitute butter instead of oil? And how much would that be? Thanks! Thank you so much for sharing your recipe! I tried it this evening and the cupcakes are sheer indulgence! It’s already a family favourite! Hello there, thanks so much for sharing your recipe, I made a double batch tonight of standard muffin size cupcakes and actually got 70 beautiful, deliciously soft red velvet cupcakes out! I am not a cook or baker but offered to make Red Velvet cupcakes for a birthday party this weekend. Being the perfectionist I am, I have tried 6 recipes and yours was hands down the best! Thanks so much but I do have one question. The top of the cupcakes are just a little bit crispy. I do not think it is the oven as the others did not have this issue. Is it the sugar, the oil, or I did double the Cocoa but I doubt this would cause it? I made the recipe twice and both times resulted in a crispy top. Any suggestions? You were spot on with the butter recipes – results in a much drier cupcake. I never understand Red Velvet until I researched, learning it is a cocoa flavor! I found doubling the cocoa to be great for my palate and not overwhelming at all. Additional cocoa did not impact the brilliant red color. Frosting was beautiful and perfect to decorate, especially for a newbie! With your help, resolving the crispy top will take the cupcake from a 9 to a 10.5! Thanks so much for recipe…if it were not for yours I would be frantically looking to buy them! Hi there! Thanks for the feedback, I’m glad you liked the red velvet cake recipe and frosting! It’s one of my favorites too. I’m not sure why the tops are crispy? That’s not something I’ve ever noticed… as I generally use frosting to cover the tops anyways, and by the time they are eaten, the tops are rather moist. It might be the oil… the oil does make the cake portion much more moist, but if your oven runs hot, it could cause the top to cook a bit faster than the rest of the cupcake. Maybe try baking 5 degrees lower temperature and see if that helps? I have tried this recipe 3 times. None of them have been successful. The last two batches were so sunk in the middle. The third time I was careful not to over mix – still sunk. Baking soda is brand new. I just realized I put the dry ingredients into the wet ingredients instead of the opposite way like you say to. Does that really make a difference?? It’s the only thing I didn’t follow. Hi April, I don’t know what to tell you… I’ve never had that problem ever before, and this is one of my most requested recipes. Are you using exactly 1 level teaspoon of baking soda (no more, no less)? Adding too much baking soda can cause your cake to collapse. Also, how long did you bake the cupcakes for? The baking times are guidelines – you may need to bake your cupcakes longer depending on how hot your oven is, your atmospheric conditions, the temperature of your ingredients, and how much moisture is in your ingredients. Make sure the cupcakes are actually done before removing from the oven – I prefer not to use the toothpick test – I push the center of the cupcake with a clean finger tip and if it springs back, it’s done. If it still feels soft, or forms a dent, you need to bake longer. If your cupcakes were normal looking then sunk after removing the oven, the #1 reason for this problem is underbaking. Did you open the oven at all during the baking process? Was your oven fully preheated? I know you said you didn’t overmix – you only want to mix the wet and dry together just until barely combined, no longer. If you think your oven might be too hot (temperature can vary if the oven is not calibrated), the outsides can cook before the insides, causing the center not to be set while giving the appearance of doneness – in this case, you might try turning the temperature down by 5 degrees and extending the baking time a bit longer. Yes, all my measurements are USA volumetric measurements. Hi there. I have tried your recipe a few times and each time my cupcakes sunk in the middle. I tried using less sugar and even adding and extra tsp of baking powder. But the cake rises and then sinks while still in the oven. When I remove from oven the sides are crispy and the center is soft but sunken. It never rises up again. I don’t even open the oven until 20 mins are up. The cupcakes are divine, but how do I get them to rise. Please help !!! You cannot change the ratio of ingredients in this recipe. Decreasing the sugar, adding extra or too little leavening agents will cause your structure to collapse. For many people OVER leavening (by adding too much baking soda) can cause problems. I think the issue is that you are using baking POWDER, when the recipe does NOT call for baking powder. You need to use baking SODA – which is not the same at all as baking powder. Baking soda is alkali, which is designed to react with the acid in this recipe. Baking powder has an acid + alkali leavening which will react with itself. If you use one instead of the other, you will throw off the acid/base balance in the recipe, causing a failed reaction. Make sure you use the exact amount of leavening – too little or too much will alter the structure and cause problems rising. Also, remember the cooking time is a guideline. 20 minutes is the minimum baking time for these cupcakes. It can take up to 30 minutes for these cupcakes to finish baking – maybe start checking them at 25 minutes, not 20 minutes. Also, the top may seem a bit hard at first – but after you frost them, the frosting will soften up the top part quite a bit. Yes, you can. Use 1 cup + 2 T. cake flour to substitute for 1 c. all purpose flour. Probably up to two days is fine for the cake portion (cover with plastic wrap to store)… I wouldn’t frost them more than the night before though. Hi, I bake this 2 days ago for my friends to taste. They love this cupcake even if I think I over baked in. I’ll try it again next time. I have a question, I tried to feel the top its already firm but when I use a stick / tester the inside of the cupcake its still sticky so I added 5 more minutes. which one should i follow? the firm top or the sticky inside? I know that its moist but afraid that it would turn out underbaked if I follow the firm top so I added 5 more minutes but it seems its dry. What should I do? I hope you can help me. Thank you! Love this cupcake and will do it again soon! It’s ok if the top is firm. There is quite a bit of fat in the recipe, so the tops can end up a bit crispy. 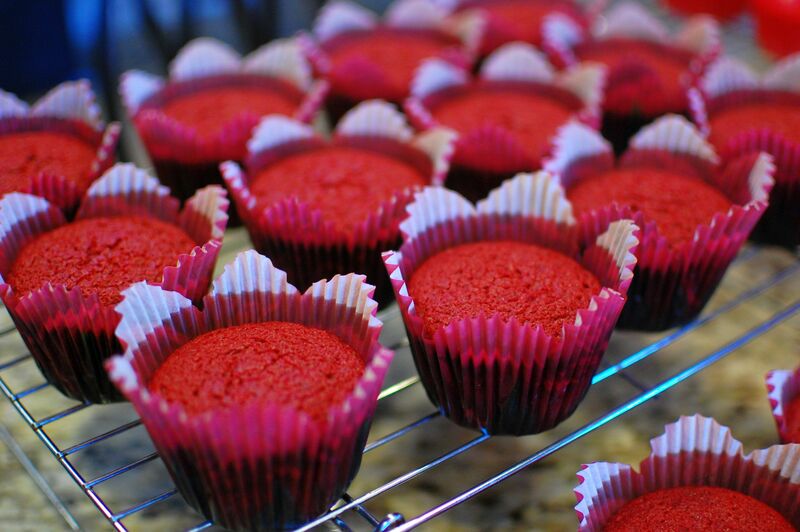 It doesn’t matter though, because once you frost them… the tops will soften up due to the moisture in the frosting. If you underbake, then the cupcakes will sink. You don’t want a sticky, goey, undone center… so go with the toothpick! thank you! I will do this again for sure. here are the links of my version of your red velvet. They look lovely! Good job decorating! Hi Mika! I would love to try this recipe and I was wondering if I can use Pure Alkhalized Cocoa Powder? Hi there! No, it’s not a good idea to substitute Dutch or “Alkalized” Cocoa Powder for regular Cocoa powder. Because of the different pH, these ingredients are not interchangeable. It will throw off the balance in the recipe, and will cause problems with the rising. Hi… I can’t wait to try your recipe… I have been looking for the Ultimate red velvet recipe and I hope this will be it.. but I have a question though… What’s the difference if I used vegetable oil instead of canola oil? I hope you can reply.. Thank you in advance.. There isn’t much difference. You can use any mild vegetable oil. I like Canola oil because it is “healthier” – as it is higher in monounsaturated fats and has a higher amount of Omega-3′s. Thanks for replying.. I will try this recipe tomorrow! So excited! Hello Mika! I’ve been searching for red velvet recipes online and suddenly I came across your website and I loved your recipes! I was wondering what brand of cream cheese did you use? 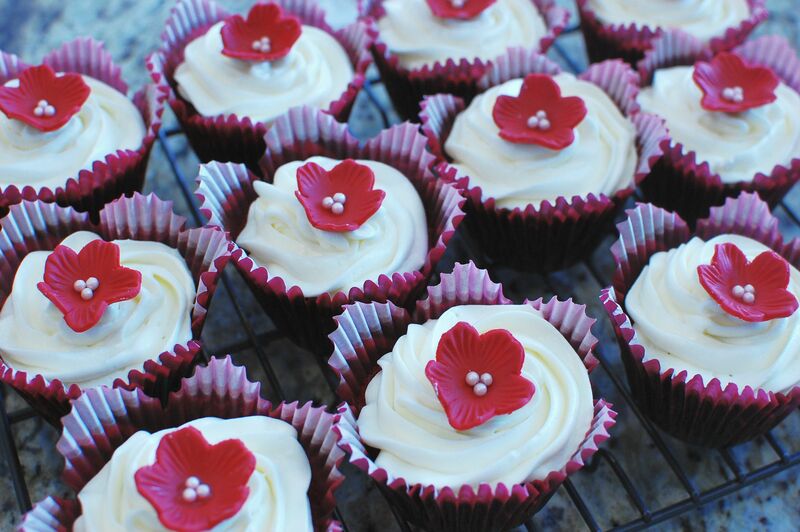 I’d love to make this red velvet cupcakes soon! I like Philadelphia brand cream cheese – they come in 8 oz. boxes which is pretty convenient for measurement. I recently made your red velvet cupcakes with your cream cheese recipe for chinese new year and they were a huge hit! Thank you for sharing this recipe ! Tried this recipe today and mine also sunk while still in the oven. I left them in hoping they would raise with no luck. They were then over baked and dry. Perhaps the recipe is incorrect when you say “do not over mix”. It needs some air in it or maybe it is just a bad recipe. I am a very experienced baker and have never had this problem. Don’t waste your time on this recipe! I’m sorry that my recipe didn’t work for you. I’m really not sure why certain people are having issues (and others are not)… I verified the recipe to make sure I listed the ingredients correctly, and the recipe posted above is correct. It could be a factor of climate, elevation, and humidity. I live in a fairly dry climate, close to sea level… so in a more humid climate or higher elevations that could cause something to go wrong maybe? If you suspect that is the issue, I would consider omitting 1/2 c. of the sugar in the cake batter recipe to lighten the batter somewhat, as this is a high ratio recipe. (Also, make sure you use a low protein (all purpose) flour – because higher protein (all purpose) flours don’t do as well in high ratio recipes.) You can try googling the brand of flour you use to find out if it is considered a high or low protein flour – they are not all the same. I will note that cakes leavened with baking soda and acid are much less forgiving than recipes leavened with baking powder (which contains a base AND an acid – so it reacts with itself to leaven). Something to mention is that regular unsweetened cocoa powder is acidic in nature, and counts as part of the “acid” in this recipe. If you use “dutch” or “alkalized cocoa powder” to substitute for the regular cocoa powder, then you will definitely have a (chemistry) problem. So check and make sure that you are not using dutch process cocoa by mistake. As most experienced bakers know, you definitely don’t want to over mix the batter! Over mixing leads to a heavy texture (due to development of gluten) and does nothing to create more rising power. If anything, over mixing will cause your batter to fall flat, and create a huge problem with rising (in addition to the texture problem). So I definitely wouldn’t suggest doing that! I have made this recipe on multiple occasions and never have had it sink. They have always turned out great! Glad it worked out for you! I’m really not sure why it works for me and many others… but for some people it doesn’t work. So I’m glad to hear some positive feedback! Mine sunk in for the eighth time and I had a professional baker come to my house and observe what I wa doing wrong.. To her dismay, it sunk in again even with her supervision ! Therefore, I took the recipes advice to try ceramic pizza stone and it worked marvelously! The only drawbacks to this recipe is how extremely oily is that it literally seaps into my cupcake liners.. Not appealing to the eye at all and how it doesn’t melt in your mouth ;-( Other than that.. It definitely beats those cupcakes stores.. I just wish I can have cupcakes that melts in your mouth..I had one experience of such cupcakes and tried to get the recipe but the person did not want to share;( Super moist and super tasty! I am still on a mission to find those moist, light and airy deliciously tasty cupcakes! Glad to hear that it finally worked out for you – that’s dedication, trying a recipe 8 times! I’m very impressed by your efforts! Uneven heating is the bane of cake baking… that’s why I like to put a ceramic pizza stone in the bottom of my oven for more even baking. Most ovens will cycle on and off, creating a wave of temperatures hotter and colder hovering “around” the temperature that you actually want. Imagine a wave function, up and down around a target line… and realize that for some ovens, the peak and trough of that wave will be much higher than more precise ovens. If there is greater temperature variation while baking, this can wreck havoc on your final result! Since you never know what your oven is doing… a little insurance (in the form of a pizza stone or unglazed ceramic tile in the bottom of your oven) can really help. Hi there! I’m glad to hear that it worked out. Substituting lemon juice for the vinegar is fine – since both are acidic, it serves the same purpose (to react with the baking soda). Also, it’s usually fine to substitute buttermilk for sour cream in this cake – I like the sour cream better, but you can use either. You don’t really have to whip the egg white, but it won’t hurt anything if you do – so that’s fine too if you like, just a little extra work. By adding using a little bit of corn flour, you decreased the protein content of the regular flour slightly – which is completely fine in a cake. I wouldn’t substitute more than 1/4 cup though. Good job! I came across your recipe when i was just about going to start baking with another recipe. But I read all your detailed responses and decided to give yours a try since your cup cakes turn out super moist. I have one question. Can you suggest what amount of buttermilk should I use if I want to replace the sour cream. I don’t get ready made sour cream in my area and i dont have enough time to make it at home. I can make buttermilk. Hoping i get a response from you. You can substitute with an equal amount of buttermilk. (So 1 cup). I tried your cupcakes in 2014 and everyone loved them. Im back again with a question. Can I use the same recipe for a cake. Im going to use a 9” and 12” pan for a two tier cake. Hi there! If I understand correctly, you are planning to make two round cakes (to stack), one 9″ round, and one 12″ round? I’m not sure if there will be enough batter in this recipe (above) to do so (and keep in mind the 12″ cake will take longer to bake). You might have a little extra batter leftover that you can make a few cupcakes with! I’ve been baking this cake for quite some time and it has been really awesome! However, I have been experiencing drastic differences. The cakes smells great, but the taste doesn’t deliever the classical taste. Any tips? Could there be a problem with changes in materials such as eggs, or sugar or something? Please help. Awesome recipe! Followed it exactly except one thing…I used a red velvet emulsion instead of food colouring …so goooooood!! I have been looking for a great red velvet cup cake recipe & thanks to you I think I’ve found it. Can’t wait to try it, I will post results as soon as I take my firsy bite! The recipe was very easy and delicious to the taste still want a bit more moisture, what can you suggest? If you want to increase the moisture, you can brush the tops of the cupcakes with a simple syrup (1:1 ratio of sugar dissolved in water) before frosting. Hey! I tried this recipe and I’m very happy with the taste and level of moistness. The sour cream was a great addition and it definitely did the trick. I used this recipe to make a cake instead of cupcakes and I kept peeking at it in the oven to check if it was done so my cake fell flat. No biggie…this was an experimental cake. Other than that I will be using this recipe from now on. Thanks a lot! Great recipe, baked it with my daughter, and everything went perfect, everyone loved them. Yay! Glad it worked for you. This seems to be a finicky recipe… not sure why… but I’m glad that you liked it! Hi Mika, I soooo want to try these…. but I’m in Colorado at 7000 feet. Do you suggest that the recipe to be altered for High Altitude? If so, what do you suggest. I know it has something to do with the leavening (baking soda) but I’ve heard so many “rules”. I’ve heard add extra flour, more liquid, less baking soda, decrease sugar, use only large to extra large eggs. Ahhhh! So many rules, so little time THANKS! Thanks Mika for getting back with me! Unfortunately…. I JUST made them (they are still warm) and they did NOT work. So FYI…if you live at high altitude, it’s “no-go” for this recipe. They sunk in the middle and stuck to the paper muffin cups. But like all good bakers, nothing goes to waste, I’m going to crumble them up and make a light cream cheese mouse and layer them in a trifle dish. Thank you for the link and tips, and I will give your other recipe a try after I lick my wounds. im thinking of making a cake for my friend’s b-day! I was wondering if you could help me with making it. There are 2 friends so I could make 2 cakes. How long should I bake these cakes for and at what temp, and how much batter should I put in the cake? Are you friends going to be together at the same time when you serve the cake? If so, then maybe just make them one cake and have them share. If you are giving these cakes to your friends and you don’t want to share – then serve it as two single layer cakes instead of one double layer cake. That’s strange… I’m not sure why that would happen. Did you make sure to mix the sugar into the WET ingredients and fully dissolve before combining the wet into the dry? I made my first attempt at red velvet cupcakes after a disasterous attempt with a nigella lawson recipe and followed your recipe to the letter. My first batch came out sunk in the middle so i tried the next batch on the middle shelf of my fan assisted oven and the same thing happened. so with the last few i had left to bake i tried turning the temp down slightly as have been reading that oven could be too hot, well last batch did exactly the same, 1 batch was done for 18 minutes, 2nd for 20 mins and 3rd for 30 mins and all sunk during baking. So not happy as i was making them for a special occaision. what has gone wrong. I’m not sure. They never sink on me. Some people tell me that this recipe works great for them, some people tell me that it doesn’t work. The only variable I can account for is the ingredients or how they are measured… not all ingredients are the same. I use daisy brand sour cream (I often choose the light version over the full fat), I use canola oil, and straight white vinegar from the big jugs they sell at the market. Since I bake often, my baking soda is usually used within a few months of opening – make sure your baking soda is fresh. Hi Mika. I made these cupcakes today, your recipe was very similar to my one, I just had half a cup less of sugar, so I went with that. I used castor sugar – not because I didn’t want to use granulated. I baked them with buttermilk – only because I didn’t have sour cream to hand. I baked them for 20 minutes, and the recipe made 32. They came out perfectly. No sinking, no oily cupcakes, nothing. Perfect. Thank you for restoring my faith in red velvet cupcakes And I’ve just tasted one…….DEEEEELICIOUS. Not too wet, not too dry, but just perfect. I just wanna ask how many cups of cake flour if I used them instead of the all purpose flour? How many cups of cake flour for 30 pieces of cupcakes? Want to know how many cups of cake flour but the same number or quantity of the cupcakes. Thank You! Can I substitute butter from canola oil? And how many cups of butter? One more thing, if I used cake flour instead of all purpose flour, how many cups will I use with the same quantity ( 30 pieces for regular liners)? Please reply immediately. I will use this ingredients and procedures of yours to our practical test. So, I’m waiting for your reply Mika! Thank you and God bless! Want to ask again how many cups of cake flour will I use to replace the All-Purpose Flour? How many cups of cake flour will I use but the same quantity of cupcakes (30 pieces for regular liners)? Thank You! I’m changing my mind so instead I pick the link of yours you send to me, I will use this recipe posted in this page. If I will replace the all purpose flour to cake flour, how many cups of cake flour I will use to substitute the all purpose flour but in the same quantity (30 pieces of cupcakes for regular liners)? I just want to substitute cake flour that’s all. Cake flour only because when I see the recipe of the link you send, it is only for 16-18 pieces of cupcakes and the ingredients like buttermilk (I’m allergic to) so I can’t pick that recipe. Instead I will pick this ultimate moist red velvet cupcake but want to change all purpose flour to cake flour. My only question is HOW MANY CUPS OF CAKE FLOUR TO BE USED TO REPLACE THE ALL PURPOSE FLOUR? Thank you and please reply immediately! Hi there Leanna. I understand what you are asking me for. The problem is this particular recipe (above) is quite finicky, and it seems to work very well for some people, and not so well for others (as you can see in the comments above). For that reason, I do not suggest any substitutions in this particular recipe. I would hate for you to waste your time and ingredients and be disappointed with the result. For the recipe linked below, I’m not sure why you think it yields 16-18 cupcakes… because that is not the case (the recipe does not state that yield). It will yield at least 24 cupcakes, potentially more. The volume of the batter in the recipe in the link below is pretty similar to the batter in the recipe post above (at the top of this page). If you are allergic to buttermilk and want to use the other recipe (the butter recipe with cake flour), then you can substitute the buttermilk with sour milk (or sour cream mixed with milk to thin it a bit) instead. To make milk sour, you add 1 T. lemon juice or vinegar to 1 c. REGULAR milk.